Well, it’s official. Carrie Jung will be getting married to Jon Clausen on June 5th, 2010… and there are now 85 wedding invitations out there that back up the whole story. 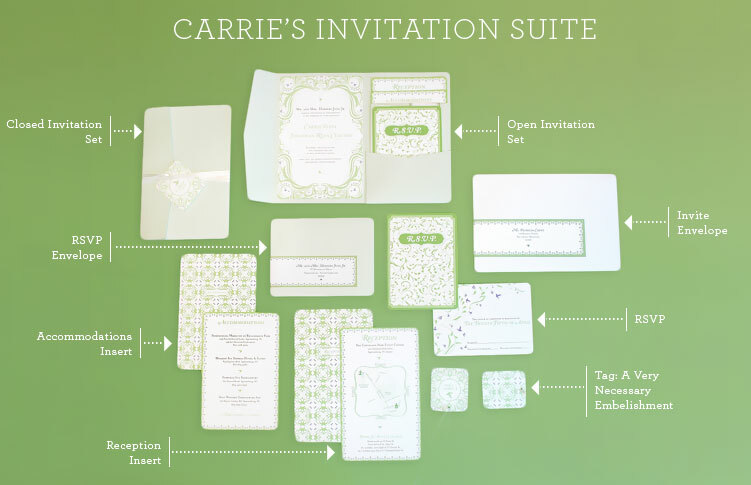 As my wedding present to Carrie, I designed her invitations and took care of all the printing. Carrie headed up the production department and cut, scored, folded, glued, and corner punched each of these 85 invitiation suites (see Carrie below). Needless to say they took a LONG time to make… fights have broken out… tears have been shed… doors slammed… tv remotes and tape dispensers have been hurled across the living room… It’s been a long, ugly journey… but I feel as though the end result has made it all worth it. 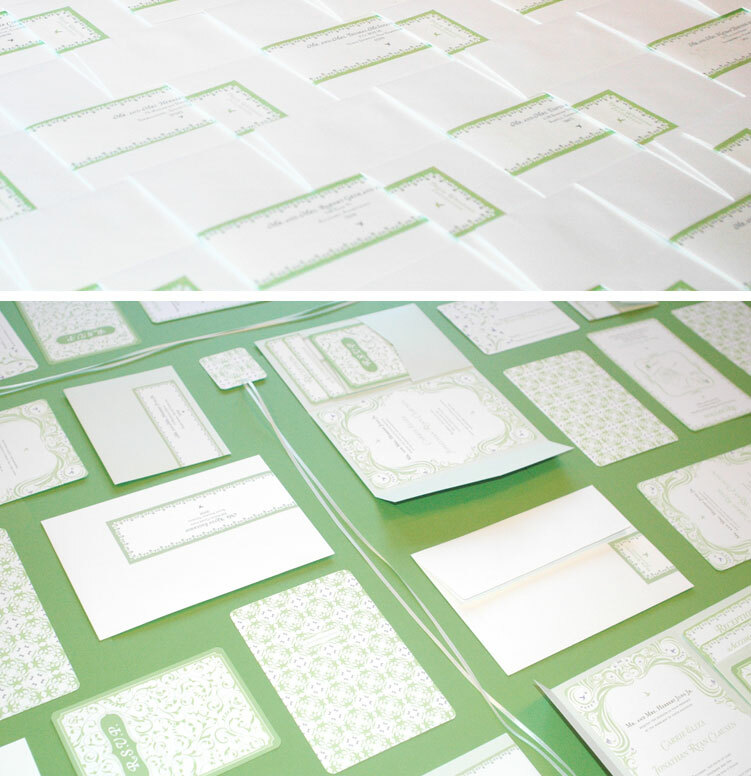 Formally worded invitations from back in the day were usually typed in a sappy/scripty font onto a blandly colored piece of paper (like off white or cream…) and then topped off with a sheer vellum flap of paper. But there’s no need to be boring when announcing such a happy day! I wanted this entire invitation experience to act as an emotional preview of what’s to come… The envelope contains a branded tag that identifies which item in the suite you are receiving, as well as the recipient’s address. It adds an eclectic sort of feel to the set. The first thing you will see when you open the envelope is the Invitation Folder that is folded up and held shut with a ribbon and tag. 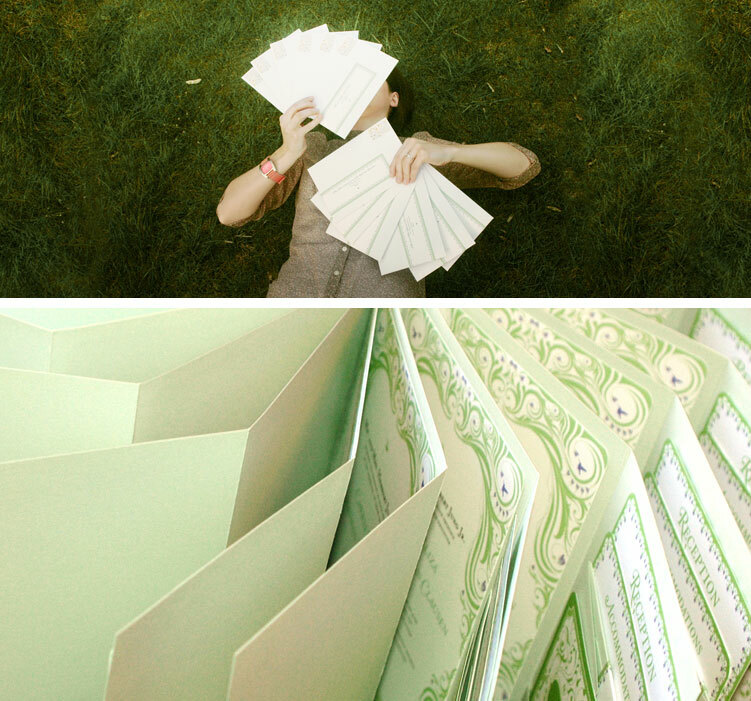 When you open it, you’ll see the invitation on the left, and a pocket on the right that holds a series of cards. They are staggered in height so that you can see the title of each card, right at first glance. 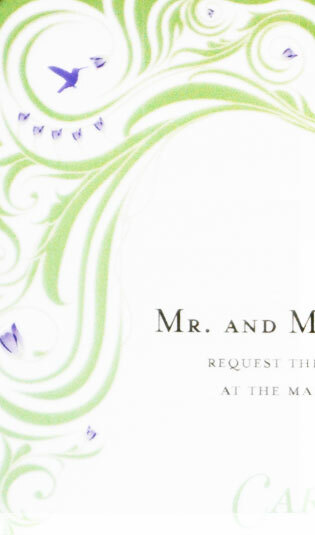 The Reception Card contains a map and a set of directions. The Accommodations Card contains a list of hotels in the area. And finally, the RSVP Card/Envelope sits in the very front of this little set. The arrangement of these individual pieces can be seen better in the photo below. I believe the little details that are added towards the end of a big project make all the difference in the world, and one of these tiny details can be viewed in the photo above. 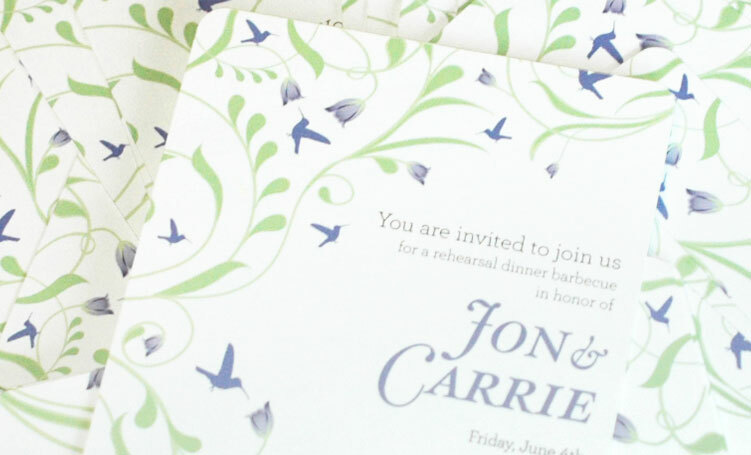 There’s a small row of purple flowers that make these invitations especially awesome… in my opinion. 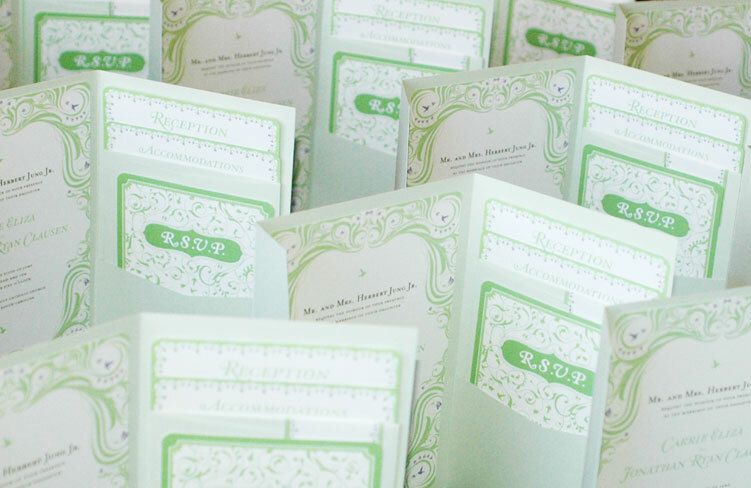 The photo above is the rehearsal dinner invitations which uses elements from the initial illustrations, but in a slightly different style. And that’s about all I’ve got… After all was said and done, I really enjoyed this whole process, so if anyone is interested in personalized wedding invitations… I’m your girl! This entry was posted in My Own Stuff and tagged Fun Little Tid Bits, My Own Projects, Wedding. Bookmark the permalink. Post a comment or leave a trackback: Trackback URL. 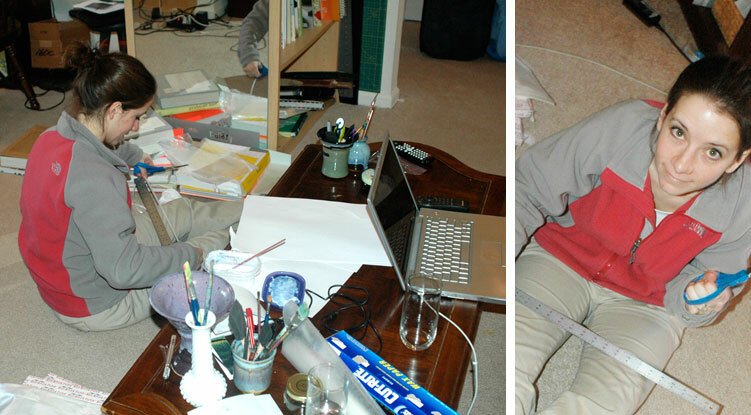 but isn’t paper your favorite thing?… you forgot to tell us all the details of the papers you used!